To say overnight oats have taken the breakfast world by storm is an understatement. There are almost half a million pictures using that hashtag on Instagram! They truly are one of the easiest breakfasts to put together, and, for the minimal amount of work required, they’re super filling and nutritious. At their most simple, overnight oats are just rolled oats that are soaked in a liquid of your choice overnight and eaten at room temperature the next morning. The fun comes with the endless flavour combinations you can use to pimp them up. Add sweeteners like raw honey or pure maple syrup to the liquid, mix chia or flax seeds with the oats for a dose of superfoods; or before eating add yoghurt, chopped fruit and nuts/nut butter for additional nutrition and decadence. You can even blend protein powder into the liquid first and eat these as your post-workout fuel. So use the recipe below simply as a guideline and enjoy playing around with your favourite foods to make a dish that you personally love. 1 cup milk (approx. 240 mls) mixed with half a tablespoon sweetener* of your choice. Simply stir everything together in a bowl and put covered in the fridge overnight! *This recipe makes the oats to my personal taste when it comes to sweetness and texture. I find many people like it sweeter and runnier so add more milk and sweetness if you prefer. I also only use vegan milks such as coconut milk or homemade nut milks because I believe them to be far more nutritious and much tastier but you can use dairy if that’s what you have to hand. 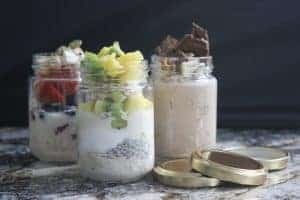 Here are 3 recipes of my favourite overnight oats to get you started with ideas. You don’t have to layer the ingredients separately in mason jars like I do for fancy photographic presentation – they’ll taste just as good all piled into a bowl together! Give the soaked oats and chia seeds a good mix. Taste to see if you want more sweetness, then add the berries and sprinkle the pumpkin seeds on top. Mix the soaked oats, chia seeds and sweetener together. Top with yoghurt and fruit. Mix with 90g rolled oats and 2 teaspoons raw shelled hemp seeds (optional) and soak overnight. Top with a few pieces of dark or raw chocolate. *We use homemade brazil nut milk for this one but use whatever you prefer. **We use Garden of Life Vanilla raw vegan protein powder. Tag The Amber Lime and Vitamin Buddy on social media to show us your own delicious creations!